Rubrik Datos IO offers fast NoSQL data recovery, any-to-any data mobility, and cost savings to organizations that rely on Apache Cassandra, DataStax Enterprise or MongoDB. In this webcast we’ll do a deep dive into how Rubrik Datos IO can save time by automatically discovering and identifying your databases and tables, how to quickly build a test/dev database from production data, and how Datos IO saves 70% or more on secondary storage with semantic deduplication – a capability unique to Rubrik. Abstract: Microsoft loves Linux, Microsoft loves Open Source, Microsoft acquires GitHub. The signs are on the wall; scripting and coding is becoming increasingly important for any role in IT. PowerShell is a crucial component in your toolkit and this live webinar with PowerShell expert, Jaap Brasser, will cover the basics and how you can get started and be successful. Native replication in NoSQL databases such as MongoDB, Apache Cassandra, and Datastax, provides high scale and availability. However, does it provide protection of critical data against logical errors and data corruption? Is native replication a good substitute for disaster recovery and other enterprise backup needs? Is your database protected for compliance and governance use-cases? 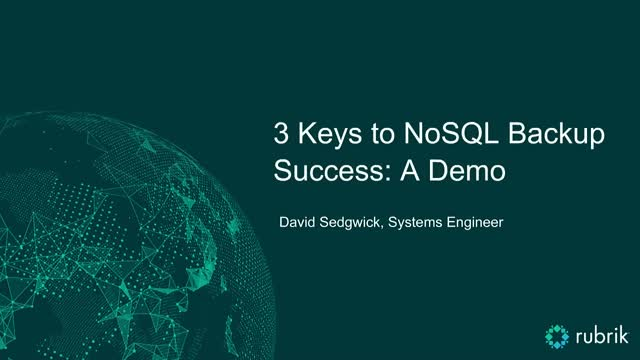 Watch this 30 minute webinar to learn about the top fallacies of using only native NoSQL database replication and the consequences of this approach to enterprise backup and recovery. Organizations are adopting next-generation applications to speed up their digital transformation initiatives and business growth. Most often, these next-generation applications are deployed on non-relational distributed (NoSQL) databases and analytical data stores for data warehousing, document management and machine learning, amongst others. Distributed non-relational databases requires careful planning for scale, performance and data protection. Hence, the choice for how you manage data protection and which vendor(s) you rely on becomes essential. Join this technical conversation to learn how Rubrik Datos IO and Google Cloud Platform can help your organization with purpose built backup and recovery, data management and data protection for NoSQL databases. Kavitha Gopalakrishnan works on the Global Technology Partnerships team at Google Cloud Platform, and leads GCP's partnerships with third-party database ISVs such as MongoDB, Elasticsearch, etc. She works on database strategy, solution development and integration, and ongoing go-to-market with strategic ISVs. Kavitha has a background in technology consulting in Financial Services and Marketing Analytics. Join this live panel discussion with experts at VMworld US for a technical deep-dive on how to build and protect hybrid cloud environments. The discussion will address customer challenges at every stage of their cloud migration and what tools can be used to make this process easier.